8 year/s ago 1453 Visit WebsiteSoftwareBroken link? 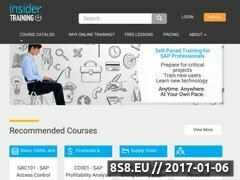 Insider Training provides training SAP training courses taught by SAPinsider content experts from around the world, designed to help you maximize your knowledge of SAP. Choose from over 40 courses on Financials, HR, SAP NetWeaver, SAP BusinessObjects, Supply Chain Management, reporting, and more.